All five naked eye planets are in the evening sky when October starts. Mercury, as usual, is hard to see though. The best views will be from around 25° south where the planet appears to be directly above the setting sun. At barely a 7.5° elongation, even at the latitude of South Africa and Paraguay, viewing time is limited. The messenger planet will be setting right as it becomes visible in the waning light. Venus starts October between and a little south of Virgo and Libra while Jupiter is in the diamond of Libra. Saturn is near Polis in the Sagittarius teapot. And Mars is in Capricornus. Mercury becomes easier to see in just a few nights. The moon is nearby and the planet is closer to Venus on the 9th. On the 10th, the moon is north of Venus and Mercury and it makes a nice triangle with them. Jupiter, exiting the Libra diamond, makes a nice addition to the party. The moon passes by Jupiter on the 11th. 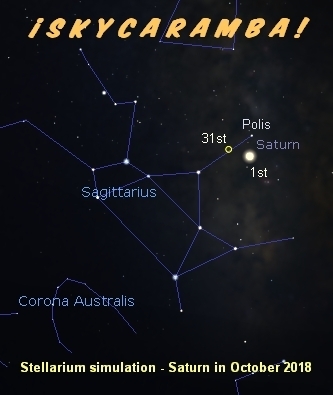 The moon visits with Saturn on the 14th. Look for Mercury and Venus together around the 15th. Mercury is at aphelion 0.467 astronomical units from the sun on the 16th. Mercury is heading eastward and Venus westward as they pass each other. The moon is approaching a rendezvous with Mars on the 17th and 18th. 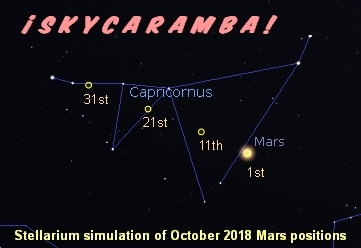 By the time the moon passes by, you’ll see that Mars has moved significantly eastward in Capricornus. The red planet will be almost out of the constellation by the end of the month. As Venus retreats into the sunset, Mercury keeps moving eastward for a meeting with Jupiter on the 27th and 28th. Mercury and Jupiter are both heading eastward, but Mercury is moving faster. 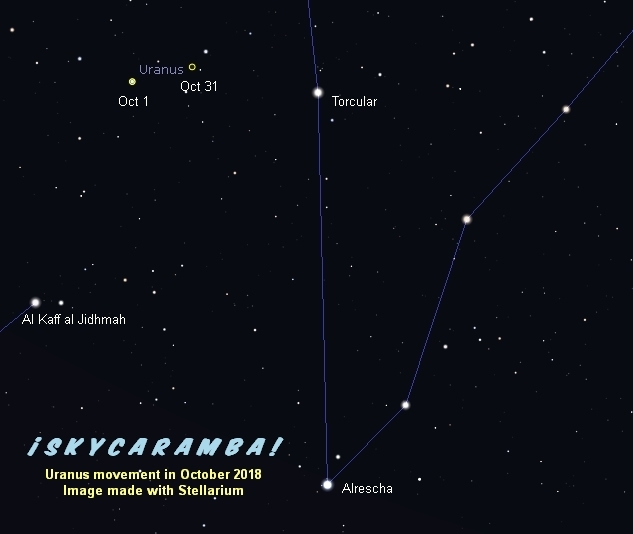 Watch into November as it heads toward Antares. There are two last quarter moons this month. The moon’s phases are last quarter on the 2nd, new on the 9th, first quarter on the 16th, full on the 24th, and last quarter again on the 31st. The moon’s positions this month are northern lunistice on the 2nd, on the equator going south on the 8th, southern lunistice on the 15th, on the equator going north on the 23rd, and northern lunistice again on the 29th. Lunar perigee happens on the 5th at a center-to-center distance of 227,600 miles (366,400 km). Apogee is on the 17th at 251,200 miles (404,200 km). Perigee occurs again on the 31st at 230,000 miles (370,100 km). Mars is at its southern solstice on the 16th. That’s the equivalent of our December solstice. Some of this month meteor shower peaks are the Draconids on or about the 8th and the Orionids on or around the 21st. Uranus is at opposition on the 24th. It’s 18.875 astronomical units from Earth.